This homemade costume for pets entered our 2012 Halloween Costume Contest, and won 3rd place in the Best Pet Costume nomination! These costumes were all hand made. The Honey Boo Boo dress was sewn by hand and frills and drop beads were added for extra glitz. The wig was created using doll hair and a some hot pink feathers were used to make the barette. The pig costume was made using foam and a pink outfit complete with curly tail. The wig is the hilarious. Made me laugh to see this picture. What great costumes! I love the effort you put into them! 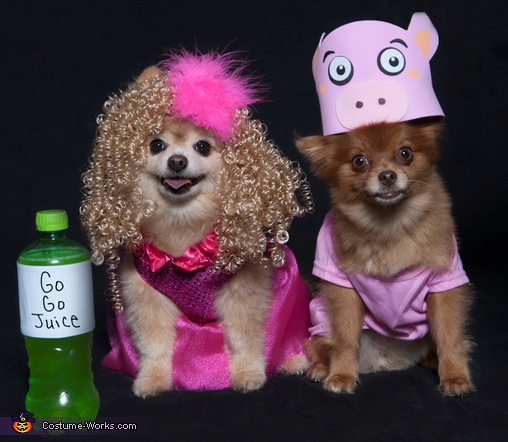 These dogs know how to do Halloween! Funny, funny, funny. This is fantastic-oooo!!! I love that curly hairdo! it's cute. good luck to you. Cute dogs. How did you get them to keep all that on? cute, cute, cute! love this photo! gl! This made my day. I can't stop laughing. Ndrew, they were pretty good about keeping it on. They pretty much only had to wear it for the picture and didn't wear it for too long though. Good luck! That is too dang cute!